What is the diference between these options below?
" 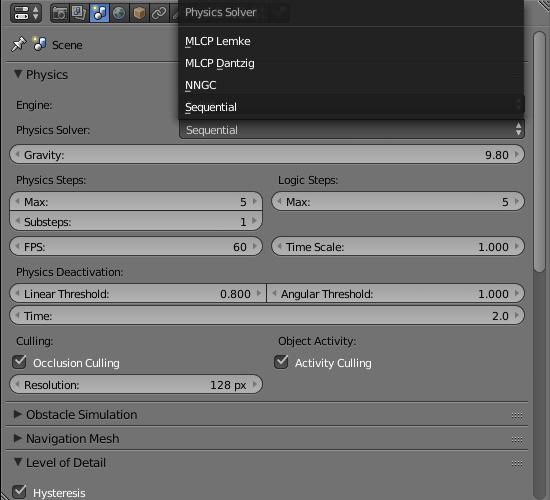 * New MLCP constraint solver interface for higher quality direct solvers. Dantzig (by Russel Smith OpenDE), PATH and Projected Gauss Seidel Mixed Linear Complementarity solvers, with fallback to the original Bullet sequential impulse solver. In a nutshell, direct MLCP solvers are useful when higher quality simulation is needed, for example in robotics. The performance is less than the PGS/SI solver, but it usually convergence faster to a good solution. See src/BulletDynamics/MLCPSolvers and Bullet/Demos/ForkLiftDemo for an example." Ok. Not what i expected to be but useful anyway. Thanks!